time, and I do not yet decide what I want to learn for the next week. So let’s stick to writing this time. Writing without the internet is fun! No distraction to watch a movie or look at my web statistic or reading some Medium article. But yeah the publishing gonna be quite late, just note for myself, I write this post on 20 October, 12.10, fast train from Shanghai to Hangzhou, for Indonesia General Election socialization program. I’m taking Chinese class now every morning, and I did not so good, compared to my peers in language campus, but hey it’s not so bad when we compare it to my peers in computer science campus. Why not so good, because of most of the student in my language class, which is now I’m in Basic level 3, they just learn some month ago, and read perfectly well, they only live in China since like 1 month ago. While me? already 2 years in China and still in Basic level 3, above my level, there is Intermediate level 1 and 2, Advance level 1 and 2. So basically my capability is just 3/7 currently. My reading is bad, I’m one of the slowest readers in class. For writing, ah forget it, I prefer writing a website with HTML & PHP code by hand, on the damn paper, rather than writing a story about a duck in Chinese character. One of my friend asking me why my Chinese learning speed so slow? I answer him, I do my learning like a marathon, a really long marathon, that last for years. My expectation is not to see the difference in months, but years. I do plan to master the Chinese language not on just like 1 years, but I expect to learn it for much more years. Just like I learn English for 3 intensive years with debating community in high school, while actually I already learn some English vocabulary since junior high school. Until now I still learn English as well, trying to write it down this time. Why did I do besides that? I do multiple marathons. I’m not a good student on single specific things. Instead, I do my learning in parallel. While I learn the Chinese language, I also learn Computer Science class. competition candidate from my city. But until now I still learn a lot of new things as well, some of my studies paid off with my research going on well. So does my web development work with Megichina, accounting cloud software in Shanghai. But then, compared to my peers in my engineering school, well, I’m kind of nobody here, I still need to learn so much more. since year 2 of her undergraduate study, last year use new tools (Stata) and method that used by her Prof to analyze the data, now she learn how to use IT tools and technique to do that. It takes years, and the result still not out yet, our paper even on revision, she did not win anything as well, but yeah she started just some years ago, let give her some time. I need to get off the train now, I’m already in Hangzhou. 21 October, in the morning. Wake up, get breakfast, breakfast in this hotel is excellent, love it. language, some come to finish their degree. Wish them all the best in their own marathon. in Balikpapan. Oh my, I miss Balikpapan crab, they produce the best black pepper crab in my opinion. Indonesia), to support student activity, and reach them out. Both of that is my marathon when I’m in Indonesia. I implement what I learn to a new place. And everything just keeps repeating itself, I never know before that I will be back to do a speech in front of the student. I just really like to be in the middle of students, well perhaps this is a natural trait, we used to live inside high school for like 13 years probably. My mother is a teacher for elementary school, while my father works in the ministry of education. Now let me pack my backpack, and get ready to get back to Shanghai, and continue my marathon in Shanghai. My marathon here in Hangzhou is over. Wish you all the best on your own marathon guys. Today is 9 September 2018, two years ago I’m coming to Shanghai Jiaotong University to continue my study. No idea at all what’s gonna happen to me here. I’m the only stupid person decided to study here from my scholarship program, LPDP (Lembaga Pengelola Dana Pendidikan, Indonesia Education Endowment Fund). And nobody ever told me what am I gonna face in here, while doing my study. Both of my parents never take beyond a bachelor degree, so they can’t really tell me what I need to prepare. People back there on my old campus, they have some idea about the study in China. Since they send a student every year to study in Beijing Institute of Technology and back to teach on campus. Well, that’s not my dream, and SJTU far heavier the challenge than BIT, so their story feels a little bit not relevant. And my XLFL, StudentsxCEOs, Intern work, and LPDP awardee, most of them go to Europe, Australia and US. With some goes to the middle east, Japan, South Korea, Hongkong. But nobody ever going to Shanghai. There are only a few of us LPDP awardee here in China, perhaps just one people in each province. So, I’m coming empty hand and empty head. In term of academic things, well, I’m the worst. I’m not following any formal study, or research or paper or anything related to academic at all while I’m doing my bachelor degree. So, no wonder everything running so hard for me for the last 2 years. The review is here, all article I have been write about my life in China. And the hardest one is my GPA mark, which is required to be at least 2.7 to graduated. And LPDP stopped my funding, since last August. Yeah, this month I’m no longer get funded by LPDP, not anymore, after two years. And I still need to live here in Shanghai, China. For at least seven more months, March 2019 is my expected graduation. Everything turns out to be well for my financial, as you could read in my previous blog post. Now money is not my issue anymore. I could live relatively well despite LPDP abandon me here. For my GPA, I recently open my school account and find out that my mark is finally passing 2.7, yay! Just a little bit above that, since one course that I redo last semester is getting B+. 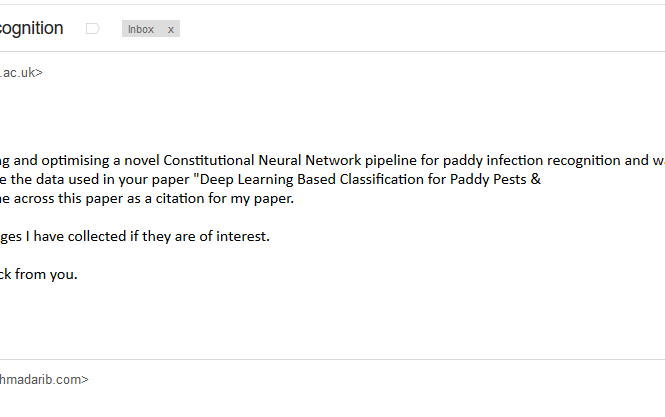 Improvement from last year which I get D. So I could submit my thesis proposal, which I have done since last semester, about my deep learning research paddy pest recognition. It’s on the link below if you guys want to read it, and cited it if needed. And that research field is going well; I get contacted by one student from Warwick University, UK, that also work for this field, and would like to use my image dataset. 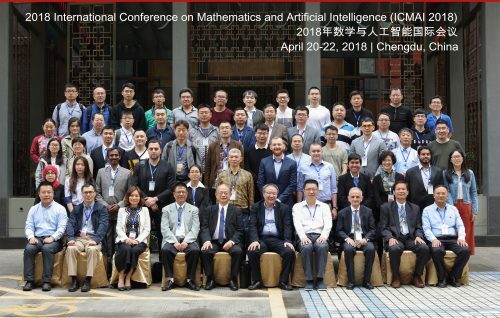 And not just that, I get news that one competition about Artificial Intelligence is doing this exact field. With a quite significant amount of money prize. Well well well, it’s time to rolling my sleeve and say hi to my GPU again, time to work. Some people research for the sake of research itself. But for me, I want to see the direct result from my research work. I want to work on a problem faced by real people. So that’s why I choose that research on the first place, and it was giving me much. Like get my ticket home, presentation in the conference, finishing my degree materials, and excellent learning experience. This research is the entry point that makes me understand artificial intelligence, even just a little bit part of it. Now I’m in the final game, in the last semester. Doing everything at once, writing my thesis, doing AI research, doing some AI competition. Working with the Indonesian embassy in Shanghai to conduct general election 2019. Working at my intern place where we do web development with WordPress and managing their Alibaba cloud server. Writing about everything with a focus on academic writing and technical writing (now in English, yay). And Chinese language study too, I have taken another semester to study the Chinese language at Shanghai Normal University. Oh my God, just thinking about it feels so heavy and hard, but that’s my choice. While my LPDP friends they all already finished their master degree. Some even end it faster, just one year completing the master degree. And here I am, still one more semester ahead, not even finish writing my thesis. But then, everyone starting differently, for me, I’m just a stupid guy from a silly place, that learn everything along the way by trial and error. Wish me luck, and wish you all the best too, my friend. Blog post special request from Lemington, here you go bro! Notes: This is my first blog post in English, from now I’m trying to deliver my writing in English, as practice to improve my English Writing skill, however, as journal reviewer who reject our manuscript said, my English writing skill is “extremely poor”, so please help me point out where I make mistake in comment section. 30 July 2018, on the train again, well, I have no idea why I really like to write on the train, some of my blog posts are published on the train actually. I love to deliver my idea inside this moving things, hear people around me talking in the incomprehensible language in my ear, then looking out the window, seeing some building pass by, some farm and some road. But this time I’m not alone, my girlfriend Chisillia is beside me, we ride the fast train together, back to Shanghai, from our business trip in Yiwu. From Yiwu Foreign Affair Office (FAO) called Global Youth Business Program, the second session. 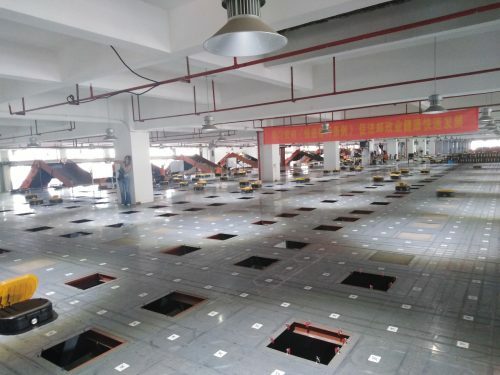 Yiwu is famous for their small commodity market, and yep they have a damn big market. People around the world are coming here to buy everything. 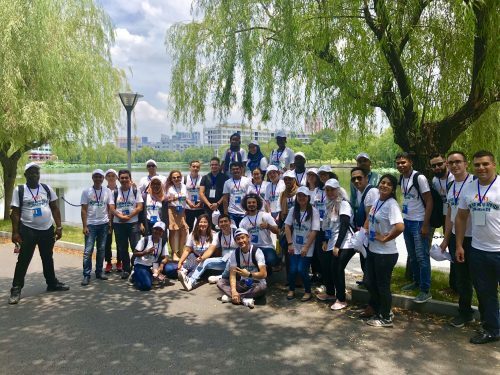 We got selected from a list of the candidate from around the world to join into this program, they provide us with accommodation and everything in Yiwu and the program fee is free, but transport from our own place by our own. For us that’s not a big deal, Shanghai-Yiwu fast train is quite cheap and just take around 1,5 hours. I will put my activity review below, but before that, since I skip posting May & June, let me give you a brief story about what happened in that 2 months. Last March https://ahmadarib.com/17th-month-ketika-pendidikan-sudah-gag-gratisan-lagi.html, I write that I have no funding again from LPDP, while my study still until March 2019, there are 6 months to go, without funding. School fee is on my parents, but I’m thinking about the monthly expense, like food, place to live, and some other extra activity that I took, including my plan to take Chinese language class for one more semester, in the same University like before, Shanghai Normal University. And I try my best to find any opportunity, I apply anything my eye could see, intern, work at Indonesian embassy, fulltime, work back to Indonesia, just anything that I could find. It must be right when people said lady luck favors the one who tried. That’s enough I guess, but since I already put my CV everywhere, some still calling me even if my problem basically solved at that time. One company offer me an internship position to handle their web development, they use WordPress. My direct manager is a guy around my age from Iceland, already 6 years in China. He does his bachelor here in China. Awesome guy, his name is Valur, I learn much from him and my new working place, a startup that does Accounting Service on the cloud called Megi China. 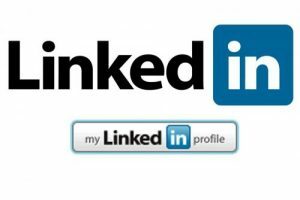 And I do help them with WordPress web development for marketing purpose. The payment is reasonable, they expect me to work 20 hours a week, which is half of full-time work. And get the same amount as my monthly living allowance LPDP, if I work for the full month, which this month not fulfilled since I go to Yiwu to attend Business Trip. I take this offer since they are welcoming me with an excellent offer, not just work half time, I also have the option to do remote work, since from my campus in Minhang to office take around 1,5 hours, damn, my school is so far from the city center. And I also get fulltime work offer from Huawei, after the long tiring process in Huawei recruitment, CV screening, interview with Huawei technical people in Huawei Shanghai R&D center, and interview call with Huawei Indonesia. They finally come to give me an offer, but, the one that provides me the offer is Huawei Jakarta. Hmm, strange things, but let’s hear what they say. The HR call me, from Indonesia, really messed up since at first, they insist on calling me via Whatsapp, and I talk to them that Whatsapp is blocked here. Then I suggest skype, we do skype call. And then we discuss salary, she said my salary will be using Huawei Indonesia standard, which is 9 million rupiah. Hmm, well, I just know that this is their HR policy. But yeah, anyway, I hold 1 fulltime offer now back in Jakarta. And I’m still trying another option for fulltime employee before I graduate. 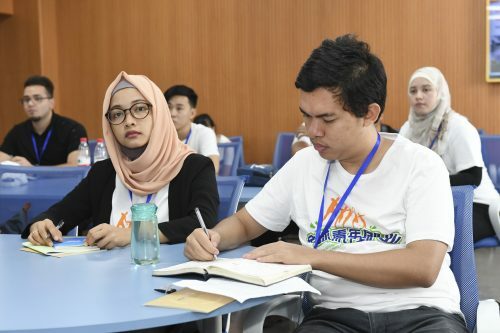 22 July 2018 is the day when we must go to Yiwu, to attend Run With Yiwu-Global Youth Business Program 2nd Session, I’m elected to participate in this program that conducted by Yiwu city Foreign Affair Office. When I take Didi Chuxing from my place to the Hongqiao Railway Station，the driver said that everyone in Shanghai just stays in their room. Because today is the first day of the storm in Shanghai, at that time, I just think like what’s the big deal, well yes it’s raining hard, but we’re using train anyway, so I guess no problem. But it turns out to be a huge problem, when we arrived in Hongqiao, the display shows all red writing, all travel is canceled for the fast train. Waiting in line to change our ticket, so many people in front, then we ask to change our ticket, the officer said we must take the slow train if we insist on being at Yiwu today. So that’s it, we take a slow train, the hard seat from another station, Shanghai South station, retake our luggage, move to Shanghai South Station by subway, arrive and wait there. In the Wechat group, everyone is screaming, flight delayed, fast train canceled, some change their mode of transport using the bus, and some follow our way, taking slow train, but with standing ticket, since all other ticket is sold out. We spend nearly 4 hours on the slow train, which in fast train Shanghai-Yiwu just take 1,5 hours. 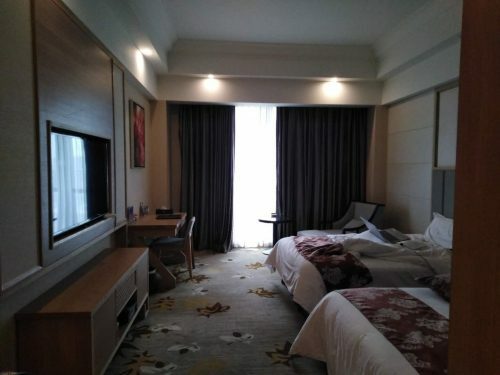 We arrived really late night at Yiwu, but we found the hotel anyway, and get into the room, the room is fantastic, big thanks to the committee for the comfortable room. Finally, have rest after a crazy day. 23 July 2018 wake up early, have breakfast in the hotel, it’s halal, and many Muslim people in the hotel, some says the owner of the hotel is Muslim also, which is really helpful for us the Muslim participant. We walk to Yiwu Industrial & Commercial College (YICC), it’s not far from our hotel to this college. One famous college for learning about business and trade. We’re greeted by YICC campus teacher, Huang Yi, that this college boosts innovation and design for the manufacturer to produce to satisfy the global market taste. The teacher said there are over 1.000 international students in Yiwu, which I consider the vast number, even compared to my University, Shanghai Jiaotong University, and the percentage of the foreigner in this small city I believe is higher compared to any other city that I already visit. Finding halal food is super easy, looking out women with hijab is standard sight here. Then we also greeted by Yiwu FAO officer, Caroline, she said welcome to Yiwu, where the air itself smells like money, so many people in Yiwu do business, trade, sell product, e-commerce, and they have expectation for us, all the participant of this program expected to start our own business related to Yiwu. And some short number about Yiwu business, they look like trying to emphasize on 4 section of the product, which is: fashion, equipment manufacturing, ICT equipment, food/medicine/health product. And so far they focused so much on export from Yiwu to all country around the world, the import to Yiwu just so few, but they’re working on it, with providing 1 district which is district 5 to be whole import product from around the world. After that, we have a mentor selection and appointment, each one of us delivers our short introduction speech, and the mentor will choose us. If it happens to be more than 1 mentor from 10 that choosing you, perhaps 3, you could select 1 that you like. In my case, only one mentor pick me, and her name is Zhang Jiying, she is a boss of massive umbrella producers, she focused on exporting umbrella to around 100 countries, including my own country, Indonesia. Looking forward to learning from her. At night we got a lecture from Zhu Yangjin, she talks about the historical story how Yiwu turn to be commodity market, which really interesting to me, how Yiwu people in the past go around and selling sugar for feather, and making the product out of that feather, and sell it again. Then they found out trade is far more profitable than farming. And currently it’s already run for like 36 years, from 1982, and now they are facing high competition from the online platform. For 20 years they win the market, everyone comes to the store, everyone come to Yiwu, but for last decade when the Alibaba and internet come, not much people come to market anymore, usually they just order sample, get into the store that they already choose, and make a deal, the next agreement usually just do by phone or simple message. 24 July 2018, the first class is by Liu Wenying from Kingston Logistic, we learn about shipping option and what is good practice to do shopping from Yiwu to any other country in the world. Like if your product is less than a container, just use a shipping agent, because the logistic company usually only deal with container size order. And she also explains what custom do, and some restriction that we need to avoid when doing the shipping, like don’t ever try to ship counterfeit product, that always means a problem for now. Also, the rate and tariff calculation when you need to do your shipping. So we could calculate how much we need to increase our product price to cover the Tariff Rate, VAT and still get profit from the business that we do. She is a knowledgeable teacher for this session, I really like her course. Then another lecture from Xiong Aisha, well, she is a teacher, if I’m not mistaken when I see her profile, she is an English teacher for e-commerce, perhaps in this school, so she is not a practitioner on this field. So she just shows some number, research, and some general knowledge that I already know. After that we go to District 1 International Trade Mart, damn, this market is so massive, so big even from the outside, when we get inside it’s get even better, so many product that they sell, any product is here, even the one that I never think or see before, they produce it all. Definitely, a must visit for anyone that come to Yiwu, and yeah most people come to Yiwu because of this market, too bad our visit here so short. Then we go to District 5, this district special only for imported product, so much product from around the world here. But not find any store from Indonesia, while there is one from Thailand, well, a little bit shame for Indonesian people I guess, we need to open one Indonesia store here that sells Indomie, haha. Then we go to Yiwu International Trade Service Center, they servicing the foreigner for visa issue, permit, and everything else they need to conduct their business here in Yiwu. In the third floor, there is Yiwu Brand Alliance, they are the most prominent brand maker here in Yiwu that goes international, and my mentor is one of them, with RST Umbrella brand name. After that, we have fun in Chengxin School, we choose activity that we want to do, and I decide to do pottery making, and my pottery turn out to be really horrible, but I like it anyway, want to do it again another time, perhaps buy the machine to do it by myself in my home later on. Really love the activity tonight. 25 July 2018 we start our class with Amazon FBA (Fulfillment by Amazon) explanation by Dai Ruiqi, I ever learn this topic before by a teacher that does it from Guangdong, also sell to Amazon in the US, while the delivery, payment and customer service is done by Amazon. We just being the one to supply the product and promoting it on Amazon. But then the lecture is not that I expected to be, there is another speaker that shares his experience at this day called Erik He, he is more down to earth and straightforward guy, I see we could follow Erik He path easily compared to Dai Ruiqi. Then we visit Yiwu-Xinjiang-Europe Freight train railway port, one large train port, but they just show some general knowledge, which most of us already know and take photos. That that interesting activity. After that, we go to International E-Commerce Town, get a talk from them, ask them out, do discussion directly with them. This complex so big, it’s great to have a government that supports the e-commerce development by providing the entire complex for e-commerce. Compared to Indonesia which our e-commerce is also blooming currently but receive near to zero support from the government. I wish my country have this kind of e-commerce complex. And we also visit STO delivery headquarter in Yiwu, they got swarm robot that does sorting parcel to deliver to the customer. Oh, my God, this is my friend research topic, and I read one of his paper before, not so cool read the article compared to see the direct action of this new technology in real life, so excellent, everything just runs smoothly, without crashing each other, efficient work by the robot. 26 July 2018 today is kind of crazy and tiring days, we must wake up so early, then taking a bus for like 1 hours to go to HC SemiTek Corporation, a high-tech factory company, just take a walk for 10 minutes, they try to explain the product but I have no idea at all. After that we visit Geely machine factory, we are looking at the assembly line for a machine, oh man, really like this one, I want to see assembly line since like a long time ago. People standing for hours doing their specific job repetitively and the product start from raw and getting completed on time, and at the end of the line the product is finished and looks so lovely. After that, we go to the canteen in YICC campus (really?, it’s so tiring to walk from bus to cafeteria) and back again to bus to go to District 5 International Trade Mart. We have Global Sales Competition, well, we need to sell the product from the specific store, and for me, it’s Thailand product store, yeah, whatever, this activity reminds me of P&G activity where our team needs to sell Gilette product, I’m just not into selling to people. At night we get to canteen again and get class lecture again, well, so tiring, and the talk about law, tough subject, and the lecturer deliver this in Chinese, oh my, whatever, I just sleep in class in this session, too tired and understand nothing from the lecturer. 27 & 28 July 2018 our team which consists of 4 people, Johny from Israel, Mahdi from Iran and Ashma from Somalia, with our mentor Zhang Jiying in her umbrella store in Yiwu market. We got a really insightful talk from her, she talks in Chinese and her employee translate it for us. Then we prepare our Business Plan，it’s about CRM system, Customer Relationship Management, by the input she said that currently they have around 3.000 customers, and they look forward to serving the existing customer and make a long-term trade with them, this is their first priority. And the same case mostly also faced by the seller in Yiwu market just like our mentor. 29 July 2018, we’re writing the essay about this activity, which is this writing product, and just hang around the town based on the schedule I got on the book. And tomorrow we present our Business Plan and get back home, for me I will be back in Shanghai, my boss in my intern place, in Indonesia embassy and also in the campus lab already waiting for me. 8 days is a long day for a run in Yiwu, the run that I planned since 2 years ago. Since I really want to know how is the export and import business here conducted, and get relevant contact in Yiwu for my future plan. So that’s all for this month. Beijing Nan – Shanghai Hongqiao. Dengan kode G115 di pojok atas, G merupakan singkatan dari Gaotie, artinya kereta cepat, kebanggaaan pemerintah China, dan mode transportasi favorit saya keliling mainland China, kenapa mainland atau daratan nyebutnya? Karena kalau kamu naik kereta cepat ini bakal keliatan kalo China itu daratan semua, dari ujung ke ujung, kadang banyak pepohonan, kadang tower-tower apartemen, kadang ladang sawah penduduk. Mudah-mudahan Gaotie bisa mampir juga ke Indonesia, yang katanya bakal melayani rute Jakarta-Bandung. Berdasarkan tiket online yang saya beli melalui App dan bayar melalui app juga, Alipay, kereta saya akan tiba di Shanghai tepat 1 jam lagi, pada 15.15, artinya masih ada 1 jam, beberapa urusan lain sudah beres tadi, jadi nulis dulu deh ini. Ada solusi atas masalah saya bulan lalu! Panitia Pemilihan Luar Negeri namanya. 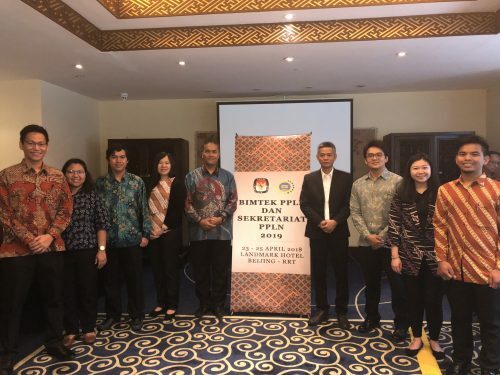 Alhamdulilah saya terpilih menjadi Panitia Pemilihan Luar Negeri Shanghai, dengan posisi sebagai Ketua, dengan honor yang tidak begitu jauh berbeda dari uang bulanan LPDP, sehingga saya masih memiliki uang bulanan untuk melanjutkan study saya di Shanghai, yeay! Man jadda Wajada, seperti yang diutarakan oleh Dimas di komentar FB, teman baik saya. Barangsiapa yang bersungguh-sungguh pasti dapat. Dan memang dapat juga solusi atas masalah berat saya. Uang bulanan aman. Uang sekolah? Kembali deh ke sponsor yang paling setia dalam setiap urusan hidup saya, yakni orangtua. Jadinya biaya sekolah menjadi tanggungan Beasiswa Ayah Ibu namanya kalo istilah kita anak-anak disini, haha. Terima kasih Ayah & Ibu, Insya Allah beasiswanya akan dimanfaatkan dengan semaksimal mungkin. Dan sebelum ke Beijing, ada trip ke Chengdu terlebih dahulu, ngapain? Liat panda! Haha, gag lah, presentasi conference math & artificial intelligence. Orang-orangnya super keren, dan saya kebagian presentasi oral mengenai paper saya. Syarat lulus punya paper dah checklist, tinggal urus nilai sama thesis aja lagi berarti urusan kampus. Kemaren milih Chengdu juga karena penasaran, banyak yang bilang kalo Chengdu itu super hot, makanannya hot banget, banyak makanan pedes dsini, cocok dengan lidah orang sumatera yang betah makan nasi padang. Cuacanya hot juga, mirip2 Bengkulu di musim panas ini. Dan katanya, katanya lho ya, ceweknya juga hot, bisa dicari deh di Google, saya tidak membenarkan, juga tidak menyalahkan statement ini, cuma menyampaikan kata-kata orang saja, karena, yah, *lirik kiri-lirik kanan*, ntar ada yang marah kalo saya iyain statement ini, haha. Chengdu lagi berkembang parah banget, banyak kesempatan disini, tempat belanja dan hiburan banyak, dan harga-harganya masih murah banget ketimbang Beijing-Shanghai. Checklist China bagian tengah-barat. Utara area Beijing udah beberapa kali. Timur area Shanghai tempat tinggal saya. Bucket list saya tinggal area Selatan aja lagi ini berarti, Guangdong, Shenzen ato Hongkong. Mudah-mudahan ada yang mau bayarin lagi nantinya, haha, saya mah apa atuh, gag ada duit sendiri untuk jalan-jalan. Semenjak merantau di Jakarta, dan kerja sana kemari, saya tahu 1 hal yang pasti. Shou yi shi huo bao, tian xia e bu dao. Yang kira-kira artinya: Ketrampilan adalah harta yang tak akan habis, menjaga seseorang tidak kelaparan kemanapun ia pergi. Gunakanlah pendidikanmu untuk mendapatkan keterampilan, yang bisa digunakan oleh pihak-pihak lainnya. Dan usahakanlah agar keterampilan ini sekhusus mungkin, dan gag banyak orang yang bisa melakukannya. Serta terus tambah keterampilanmu dari waktu ke waktu. Jadilah orang yang bermanfaat, yang bernilai, yang bisa digunakan baik oleh pemerintah, swasta, institusi pendidikan, ataupun pihak-pihak lainnya. Dan yakinlah bahwa kamu gag akan kelaparan dimanapun kamu berada.